The Adult Cardiothoracic Anesthesia Fellowship at the University of Iowa is a one-year ACGME-accredited program. Nine months of the fellowship year is dedicated to clinical anesthesia for cardiac and thoracic surgery, and then one month is focused on post-operative intensive care of adult cardiac and thoracic patients in the Cardiovascular Intensive Care Unit. The Cardiothoracic Anesthesia Division oversees 350 adult cardiac cases, 100 pediatric complex congenital heart disease cases and 450 thoracic cases per year, plus the robotic minimally invasive program. 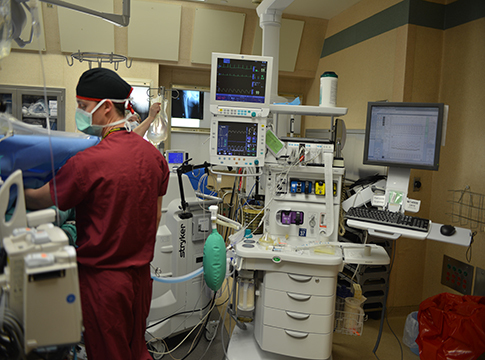 The Vascular Anesthesia Program, including the Interventional Cardiovascular Program, oversees 600 cases. Each year the department assists in 20 heart transplants and 15 lung transplants.